Earlier this week, Fox Entertainment Group’s mobile business launched its first-ever commercial iPhone application for its popular show “Family Guy.” The app was launched in collaboration with Brightcove, Rhythm New Media, a Brightcove Alliance Partner, and Sideshow, an interactive agency. The app is available for $1.99 in the app store and fans can watch clips, play games, and create video mixes from short clips. These mixes can then be uploaded to Brightcove and easily shared with friends. The “Freakin’ Sweet Family Guy” app will include up to 20 show clips, as well as links to purchase full-length episodes from iTunes. The app includes four main character-driven video channels – “Best of Stewie,” “Brian’s World,” “Peter’s Life Lessons” and “The World According to Chris.” Clips are supported by pre-roll video ads, which will generate new monetization opportunities for Fox advertisers. Fox Entertainment Group, a long-time Brightcove user, is another great example of how our customers can extend the capabilities of the Brightcove platform to mobile devices like the iPhone to reach their audience in new ways. 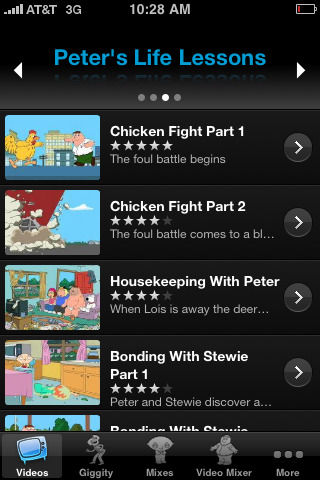 We have no doubt the popularity of “Family Guy” will make the new app a major win for the Fox Entertainment Group team.